In reality, the lamp is about as cookie cutter as it gets. 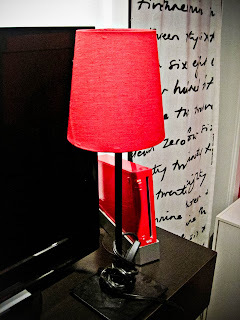 It's a simple lamp base and red shade from IKEA. 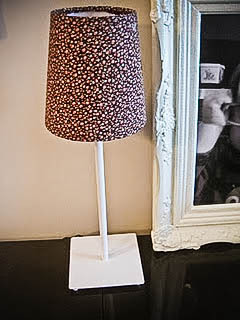 The shade was originally purchased in the AS-IS for Hazel's bedroom in our old townhouse. In our apartment, I don't really feel that this particular shade of red belongs anywhere. We've developed very specific color schemes, and with a general open living space, the importance of all areas flowing is imperative. As I didn't have the heart to donate or get rid of the shade and lamp base, I decided to give it a new lease on life! I rummaged through our bin of fabric swatches and pulled out this piece with tiny floral prints all over it. Jackie described it as being "cute", and I agree. I've been somewhat inspired by Scandinavian design in the past few weeks, and this fabric reminded me of something I would see in a Swedish home, possibly in a kitchen nook or something. 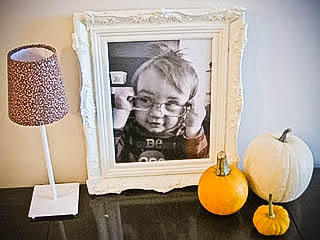 The materials I used for the project were: Mod Podge, a foam brush, and some sewing pins. I worked in 3" increments of painting the glue on the existing shade, smoothing and stretching the fabric out, and then pinning it in place to hold it while it dried. It was actually much easier to do than I thought it would be. The only difficult part of the project was attaching the fabric to the inside of the shade. I used the same glue, but the surface was plastic, and very smooth, and lacked an initial grab. After several coats of glue, however, it stuck in place. I left the shade to dry over night (and did this project while seated in bed, and was alarmed to find several pins in the bed- fortunately, I caught them all before we went to sleep!). 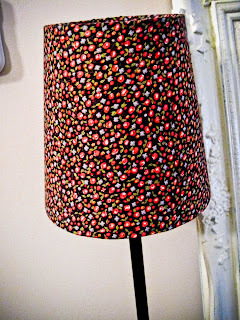 The next morning, I assembled the shade and base back together, and marveled at my first attempt of re-covering a lamp shade. Go me! I was anticipating on struggling through this project and cursing at the lamp shade and my crazy ideas- but, I was pleasantly surprised! But (and there's always a "but"), the new combined lamp seemed a bit blah. 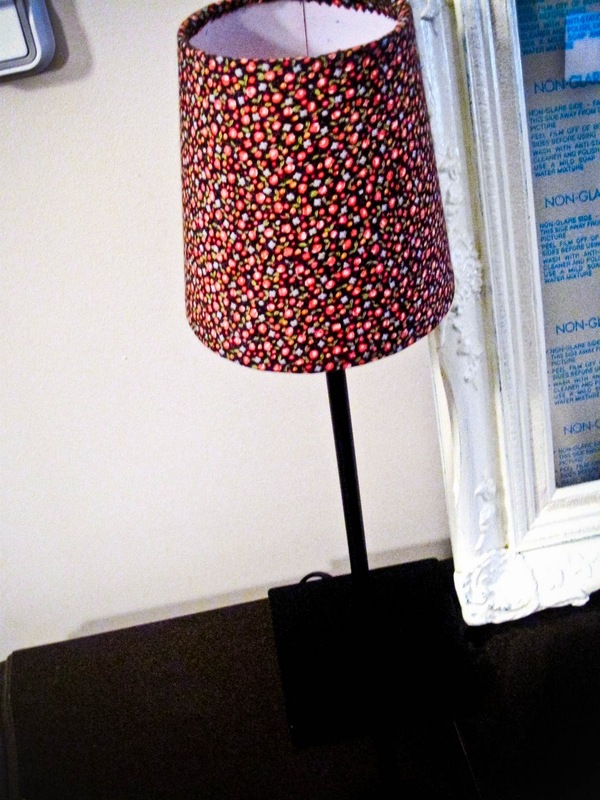 The black lamp base was just killing the bright and cheerful feel that I was going for. In a spontaneous leap, I slapped some primer on, and some white paint, and then a bit of sealer for added protection. And voila, a newly update lamp with a bright and fresh feel!